In the decade following publication of the Alvarez et al. (1980) impact hypothesis, the Raton Basin of Colorado and New Mexico (Figure 4.3) was a focus of studies of the palynological and paleobotanical records of the K-T extinctions. These studies were conducted in conjunction with a search for new localities at which the iridium anomaly was present in nonmarine rocks. The new evidence developed in the Raton Basin contributed supporting data for the impact hypothesis and played a role in the advancement of the hypothesis to the status of a theory. The primary publication, Orth et al. (1981), has already been mentioned. Confirmatory data soon followed in papers by Orth et al. (1982), Tschudy et al. (1984), and Pillmore et al. (1984). The same team of collaborators conducted the research and published these papers. Orth and his group at Los Alamos National Laboratory detected the iridium anomaly at new outcrop localities in the basin, Tschudy documented the palynological extinction at these localities and elaborated upon the fern-spore spike (see Section 5.3), and Pillmore led in the discovery of the new localities in the field and in their geological description. Palynology was the paleontological basis of all these investigations. By the mid 1980s, Wolfe and Upchurch (1986,1987a) were able to conduct paleobotanical research at some of these newly discovered K-T boundary localities and outline the leaf megafossil record in the Raton Basin. The new evidence contributed by all of these studies is discussed more fully in Section 7.2. Almost simultaneously, Jan Smit and his collaborators were making parallel discoveries at the K-T boundary in the Williston Basin (Figure 4.3), in the Hell Creek area in eastern Montana (Smit and Van der Kaars 1984, Smit et al. 1987), and research for a doctoral dissertation was under way, results of which were published some years later (Hotton 2002). These studies are discussed more fully in Section 6.3. As well, one of the localities at which Tschudy et al. (1984) found the fern-spore spike at the boundary was in the Hell Creek area, eastern Montana. New evidence came from Canada in the mid 1980s. Lerbekmo and Coulter (1984) used the expertise of Canadian palynologist Chaitanya Singh to locate the K-T boundary in the Red Deer Valley in Alberta and the Missouri River Valley in North Dakota, correlating the stratigraphic sections in those areas, and determined that the boundary was in the upper half of magnetostratigraphic sub-chron C29r. 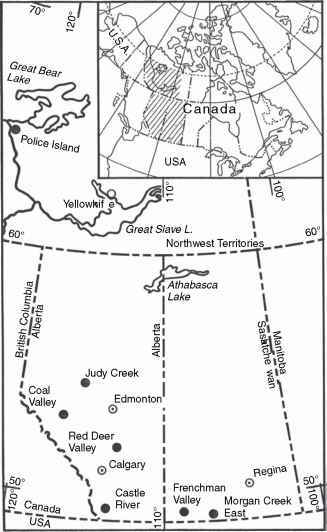 Lerbekmo (1985) used palynology and magnetostratigraphy to correlate the boundary section in Alberta with a new one in the Cypress Hills area of southwestern Saskatchewan, and he reported having found the iridium anomaly in the Alberta section. Lerbekmo advocated the iridium anomaly as the most reliable physical marker of the K-T boundary. Nichols et al. (1986) discovered a boundary section characterized by a palynological extinction, a fernspore spike, and an iridium anomaly in southern Saskatchewan. Jerzykiewicz and Sweet (1986) reported a palynologically defined K-T boundary in the Alberta foothills, and Lerbekmo et al. (1987) reported the iridium anomaly at the previously discovered K-T boundary localities in Alberta and southwestern Saskatchewan. For more detailed discussions of these Canadian localities, see Section 7.6.
boundary in the original York Canyon Core from the Raton Basin was within an interval of reversed polarity that, using the iridium anomaly, could be correlated with C29r. Bohor et al. (1987a) discovered the first K-T boundary locality in the Powder River Basin of Wyoming (Figure 4.3). In addition to a palynological extinction, fern-spore spike, and an iridium anomaly, shocked quartz was also found at this locality, as it had been in the Williston Basin in eastern Montana and in the Raton Basin (see Section 7.4). Wolfe and Upchurch (1986) compiled historical megaflora records and new data from dispersed fragments of leaf cuticle in palynological preparations from several sections containing the iridium anomaly and argued that those records supported the Alvarez hypothesis. Johnson et al. (1989) applied megafossil paleobotany as well as palynology to locate a new record of the boundary in the Williston Basin in North Dakota. This locality also has a small but significant iridium anomaly and shocked quartz is present (see Section 6.2). The discovery of new boundary localities continued into the 1990s and beyond, as is discussed in Chapters 6 and 7. Thus, by the end of the 1980s, it had become overwhelmingly clear that the K-T palynological extinction was associated with an iridium anomaly on a continental scale and it was beginning to appear that an extraterrestrial impact had generated a profound and deleterious effect on terrestrial vegetation. The nature of that effect had yet to be fully explored, especially on a global scale, but more information was being derived from new K-T boundary localities. Before examining the data from nonmarine K-T boundary localities around the world, it is fitting to present a brief overview of what is currently known of the vegetation of latest Cretaceous and early Paleocene time. It is also necessary to explain in some depth that curious earliest Paleocene palynological phenomenon, the fern-spore spike.